Every culture has its version of stew; Irish, Scouse – slow-cooked vegetables or meat with easy flavours. It’s cheap, filling and easy to cook. For my birthday last month I asked for a tagine dish. I know, I know, but I like how bright they are and wanted to see the difference in the slow-cooking technique. It coincided with discovering a rather awesome cookbook that I may write more on called The Lebanese Kitchen. Growing up in a family where food was Middle eastern it means certain flavours spark vivid memories. I’ve spent a few years hunting for recipes for different dishes like the Kahk and Mamoul we made at Easter, the stuffed Vine Leaves with meat, not mint, stuffed cabbage slow cooked and the coconut biscuits. I’d thought the recipes had died with both my nan and dad and then had a inkling when I read a Lebanese recipe. It featured a seven spice that prodded a memory. I read more and more Lebanese recipes and it began to dawn on me that the cuisine I remembered wasn’t traditionally Middle Eastern, or, more correctly, wasn’t the central Middle Eastern cuisine I expected from a family that grew up in Palestine. Jerusalem is a funny city to get a handle on cuisine from. Lebanese seemed a good place to start. So far, every recipe I’ve made tastes like something I ate when I was a child, even the tomato sauce. Back to the tagine. 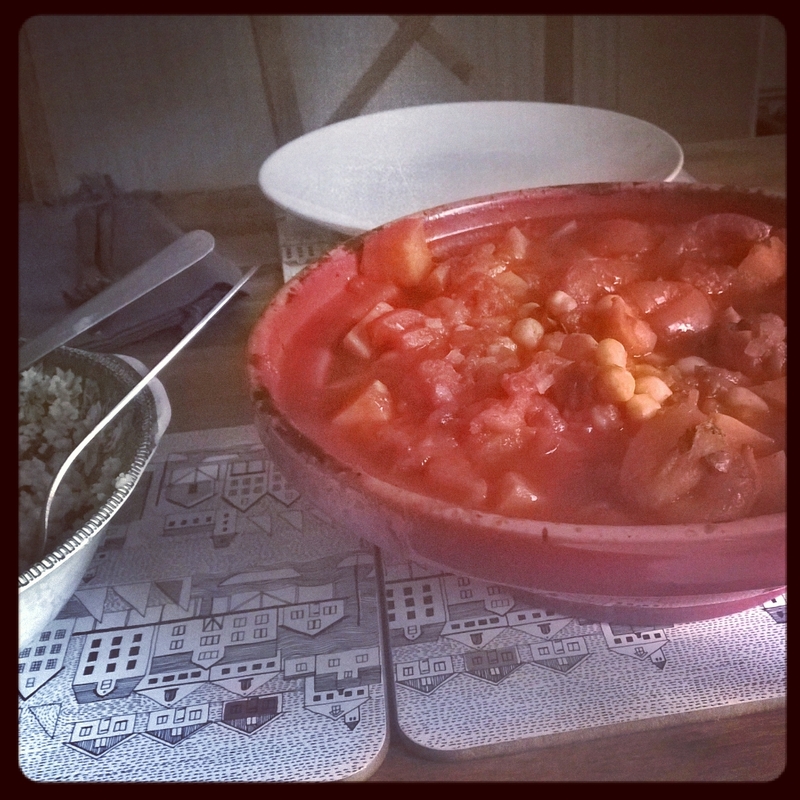 I wanted a hearty, vegetarian tagine that would use up leftovers in the cupboard and would be full of flavour. Seven Spice is a good staple to have. It includes half a cup of Black pepper, Cumin, Paprika, a quarter of a cup of Ground Coriander and Ground Cloves, Four teaspoons each of Nutmeg, Cinnamon and two teaspoons of Ground Cardamon. Search around though, as you might not like it so spicy. It makes a lot so have some spare empty spice bottles you can fill and label. A cup of stock. I used vegetable but go for any. A handful of chickpeas to go on top. First, just add the onion to a saucepan with a little oil and cook until softened. Add the spices and cook for a minute. Add the root veg and tomatoes, the chopped tomatoes, stock and the squeeze of lemon. Turn the oven onto 180 degrees. Pour the mixture into the tagine dish. Sprinkle the coriander and chickpeas onto the top. Cook for around an hour, hour 20 or until the vegetables are soft.